KUALA LUMPUR: Forget air or bus travel. Visualise yourself travelling in ultramodern, hassle-freehigh-speed trains sprinting more than 250kph from Kuala Lumpur to Singapore in just 90 minutes, door to door. Head to the Kuala Lumpur HSR (high-speed rail) terminus in Bandar Malaysia (now the Royal Malaysian Air Force Sungai Besi airbase), check in and clear both the Malaysian and Singaporean Immigration and Customs before boarding the train. A train will leave for Singapore every 15 minutes. There will be two classes of coaches — business and standard. Either way, you will be enjoying a smooth and pleasant ride, while adoring the scenic view of the countryside. At Nusajaya, the train will cross the Johor Straits to Tuas via a new rail bridge. Once you arrive at the Singapore HSR terminus in Jurong East, head to the Jurong East MRT station and, in no time, you will be in the Singapore city centre. No more Immigration queues as you have stamped your passport in Kuala Lumpur. The fast, seamless travel means you will be able to have breakfast in Kuala Lumpur, lunch in Singapore and back again for dinner in Kuala Lumpur within the same day. Right now, it takes up to six hours for a bus ride and four hours if you fly (including the time to get to the airport, waiting for check in, Immigration and boarding). 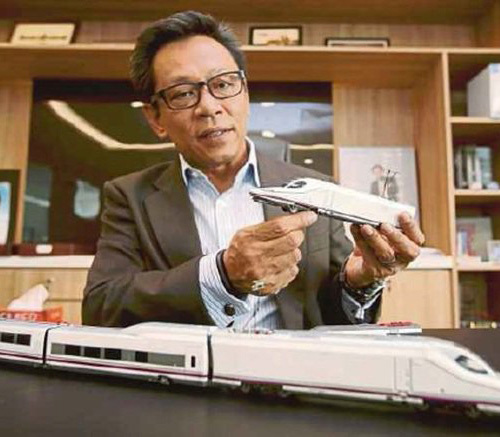 The ambitious Kuala Lumpur-Singapore HSR project, the first-ever in Southeast Asia, has been dubbed by leaders of both countries as a “gamechanger”. It will improve connectivity, change the way people travel as well as transform the economic and business activities of both Malaysia and Singapore. Prime Minister Datuk Seri Najib Razak said in New York last week that the HSR project, along with other major infrastructure projects, would proceed despite the tough economic environment. Q:When will it start and complete? A: The project, which involves building a 330km HSR line, related infrastructure and procuring the bullet trains and other systems, will start next year after the final agreement is achieved between the Malaysian and Singaporean governments. It was earlier envisaged to be completed in 2020 but both Najib and his Singapore counterpart, Lee Hsien Loong, said four months ago that the target was not realistic considering the scale and complexity of the project. Q: What is the Malaysian preparation so far? A:The government has set up a development company called MyHSR (Malaysia HSR) Corporation Sdn Bhd, a delivery agency similar to MRT Corp. The company is headed by Mohd Nur Ismail Mohamed Kamal, formerly the CEO of the Land Public Transport Commission (SPAD), which regulates the sector. Nur Ismail, an MBA holder from Northwestern University’s Kellogg School of Management, is an experienced figure in the national public transportation sector. He was formerly with A.T. Kearney and Accenture. Nur Ismail tells the New Sunday Times that the project’s next major timeline will be the signing of a bilateral agreement between Malaysia and Singapore. “The agreement will outline the basis of how this railway operates, the security features, Customs and Immigration procedures, service level and the operating structure. He says a clear milestone is to sign the bilateral pact within the first quarter of 2016. He says the agreement, to be concluded next year, will be a critical factor in deciding how the project proceeds, including how and when the international tender will be called. Q: What are the benefits of this HSR project? A: Nur Ismail says the project is not just a normal infrastructure project that yields the usual multipliereffects of construction. “It gives you that and much more. What you have seen in other places, in South Korea, Japan, France and even in the United Kingdom, the opportunity to transform economic activities is there with increased mobility and a reduced journey time. New investments will come in. Q: Are the alignment and station locations finalised? A: Nur Ismail says the proposed alignment and station locations have been some 80 per cent firmed up. A few parts are still pending input from different stakeholders. The stations will be in Bandar Malaysia, Seremban, Ayer Keroh, Muar, Batu Pahat, Nusajaya and Jurong East. Q: Who is bidding for the project? Corp, Sumitomo Corp, Hitachi and Mitsubishi Heavy Industries. Q: How much can passengers expect to pay? A: The fare structure will be dynamic, depending on the load factor and peak and non-peak hours. SPAD says a one-way ticket may cost less than RM200 per person.